I love me some brussel sprouts! They’re an amazing veg to add into your diet not only because they are low in fat in calories, but also because they are a fantastic source vitamin A and folic acid. 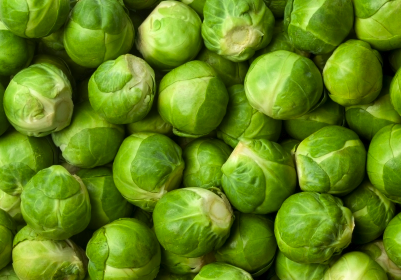 In addition to Vitamin A and folic acid, brussels sprouts are loaded potassium, calcium. They have 3-5 grams of fiber per cup, and at 25 calories per 1/2 cup cooked (steamed), they give us a reason to eat them more often. Brussels sprouts are one of those foods that will leave you with a full feeling, but won’t pack on the pounds. 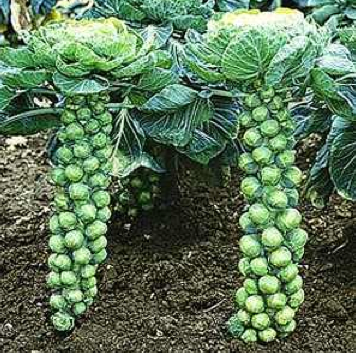 Brussels sprouts are also high in fiber, and they belong to the “disease-fighting” cabbage family. Brussels sprouts may protect against cancer with the nitrogen compounds called they contain called indoles, a form of phytochemicals, which may reduce the risk of certain cancers. Brussels sprouts are also rich in vitamin C, another anti-cancer agent. Whether you choose them for their healthiness or because you love ’em, one thing is certain…you will be doing your body good with a healthful food that is high in protein and low in fat and calories. I not only LOVE the way BSs taste, but have you ever seen how they grow? The first time I saw I nearly died (OK, fine this is me being a drama queen, total exaggeration, but) it’s SO COOL. Here’s a photo! So, not only are they fantastically delisih, but you can use them as a centerpiece or a cool decoration until you’re ready to cook ’em! This entry was posted in FIERCE FUN, FIERCE HEALTH, FIERCE- ISH and tagged #self, body, brusselsprouts, fitness, food, fun, health, holistic, love, nutrition, wellness by GETFIERCE TRAINING. Bookmark the permalink. Guess I know what I’m having for lunchie-poo! Can you see me? I’m getting fierce!